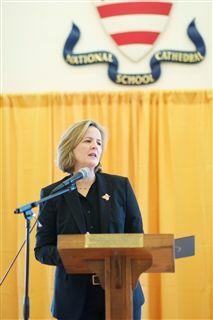 Work on NCS’ next strategic plan begins on a solid foundation of progress, reported Head of School Kathleen O’Neill Jamieson in her annual “State of the School” address on January 6, 2011. Speaking to a packed audience in Hearst Hall, Mrs. Jamieson announced that this year NCS will craft the 2012-2017 Strategic Plan, to be presented at next year’s “State of the School.” NCS’ plan is refreshed on a five-year cycle; the current plan expires in 2012. Trustees Amanda Delk and Ted Hester (both current parents) will co-chair the strategic planning effort. NCS has also engaged the consulting services of ISM (Independent School Management) for the process, which will involve parents, alumnae, faculty, staff, and students. More information about the planning process will be sent to the NCS community in the near future. • Fully three-quarters have advanced degrees. • More than half have been at NCS more than 10 years. • There is an average 18 years of experience in our faculty ranks. • Those with less experience were chosen from the best young teachers in the country. “We rarely lose a teacher we want to hire,” Jamieson said. “I have the pleasure of observing a class once a week and seeing firsthand the quality of the relationships between students and teachers, who are often described by alumnae as mentors,” she said. Under the current plan many steps have been made to maintain the highest standards, including: revised faculty evaluations; curriculum reviews in all divisions; the implementation of homework guidelines; and improved standards and methods of student assessment. “Initiatives that have most dramatically affected the girls’ experience are what I think of as the bones of the place,” Jamieson said. The academic results have been impressive: The Class of 2010 had average SAT scores of: Math, 695; critical reading, 704; and writing, 717 (out of 800). Mrs. Jamieson also reported that student retention is “exceedingly high,” with less than 2% attrition last year, compared to the national average for an independent day school of 9-11%. • The endowment has recovered to pre-recession levels of approximately $22 million. • NCS is almost exactly at the 50% mark in its $50 million dollar campaign to renovate Woodley North, increase the endowments for financial aid and faculty salaries, and support the Annual Fund. • This year’s Annual Fund hit the $1 million mark by January 1; some $600,000 remains to be raised to make the year’s goal. • $4 million remains to be raised to start Phase II of the Woodley North project, which can be completed over the summer to benefit today’s students. Mrs. Jamieson thanked the extraordinary efforts of the many parent volunteers who have made these achievements possible, as well as the trustee leaders who have exercised “extraordinary stewardship of our resources,” including: Governing Board Chair Elizabeth Hayes; Campagin Co-Chairs Carolyn Bou '78, Debra Lehman-Smith, and Kathi Loughlin; Annual Fund chairs Amanda and Mitchell Delk; and Finance Committee Chair Margarita Dilley. NCS Head of School Kathleen O'Neill Jamieson delivers the State of the School address.